Title-text: "Really, the only honest 24-hour stores are the ones in places like Arizona and Hawaii (sic), and many of them are still wrong in certain years." Including as recently as 2016. I suppose one could change them to "Always open." My favorite 7-Eleven-related quote is definitely: "We're sorta like 7-Eleven. We're not always doin' business, but we're aaaalways open..."
Took me a moment to get the joke. My first instinct was that of course it's closed because no one lives on Mars. jozwa wrote: Took me a moment to get the joke. My first instinct was that of course it's closed because no one lives on Mars. If you build it they will come. Meanwhile I always end up at the 24 hour McDonalds while they are "updating their systems", that, or just not even acknowledging the drive thru, no explanation given. Hey, at least it's not Barrayar - there, the 7-Eleven would be closed approximately 2 hours per day. Saying "OPEN 24 HOURS" to advertise never closing always seemed weird to me. Such places usually call themselves "non-stop" or "éjjel-nappali" (~"night-and-day") here, which I find much more straighforward. Surely customers don't really care about how long the shop is open, what you really want to tell them is that your shop's gonna be open anytime they show up. Last edited by somitomi on Mon Apr 17, 2017 2:53 pm UTC, edited 1 time in total. I'm still waiting for the Sidereal vs. Solar Day flamewar. C'mon, folks! Trivia: back when I was at Brown U., some blue law didn't allow all-night stores, so we used to refer to the local Store24 as "Store18" . The original 7-Elevens WERE open 16 hours a day. Depending on how you break out the Seven and Eleven, it could also be open daily from 8 AM to 7 PM (or any other combination of eleven hours a day, using the 7-by-24 version of 24 hours a day, 7 days a week). Yes, it should. According to their website, that's exactly where the name came from. The name changes from Tote’m Stores to 7-Eleven to reflect the new extended hours – 7am to 11pm, seven days a week. It says "Open 24 Hours", not "Open 24 Hours a Day". That means the store gets 24 hours total operational time. Then they have to bulldoze it and start a new one. They need 37 minutes per day to replace all the freeze dried and vacuum dessicated fruits and vegetables. Oh, wait. 7/11 doesn't have any fruits and vegetables. Maybe they can sell silica gel packs instead. Yum! squall_line wrote: Depending on how you break out the Seven and Eleven, it could also be open daily from 8 AM to 7 PM (or any other combination of eleven hours a day, using the 7-by-24 version of 24 hours a day, 7 days a week). While I have never encountered a 7-eleven (even though they do exist "nearby" in Denmark, Norway, Sweden), I've always thought the 7 was for 7 days per week and the 11 for 11 hours a day. 7 days a week, 11 weeks a year. Whizbang wrote: 7 days a week, 11 weeks a year. Or, only opens if you roll a 7 or 11 before crapping out. Zylon wrote: It says "Open 24 Hours", not "Open 24 Hours a Day". Reminds me of an old Michael Wright (?) joke where he shows up at some 24/7 convenience store and the door is locked. He knocks on the door to get the clerk's attention. Clerk comes to the door and says "We're closed." Wrights says "But the sign says you're open 24 hours!" Clerk says "Well sure, but not in a row." 7 hours a day, 11 days a week. We don't have 7 Elevens round these parts, but all the major supermarket chains have smaller stores that are generally open those hours (square-footage having relevance to Sunday trading laws). With the large 24 hour stores not able to open long hours on a Sunday, this leaves the awkward window between midnight-7am where a British person mustn't run out of milk. 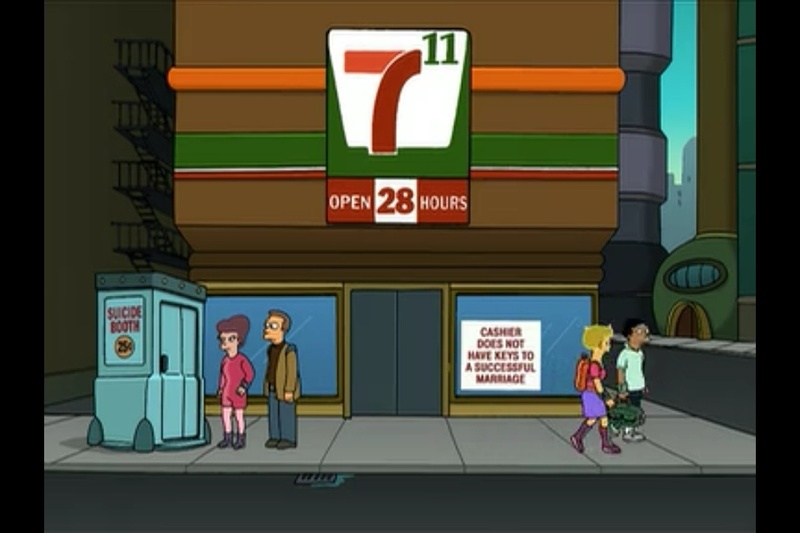 "Really, the only honest 24-hour stores are the ones in places like Arizona and Hawaii (sic), and many of them are still wrong in certain years." "Really, the only honest 24-hour stores are the ones those in places like Arizona and Hawaii (sic), and many of them are still wrong in certain years." Unless the name of the thing is one (his cake had two ones on it), one should not be plural. Think about it. The plural of ONE. If you have one of something it would be singular. If you have a plural quantity of something, you do not have one of it. The 7-11s I have actually checked have all opened at 7am, although that isn't very many of them. 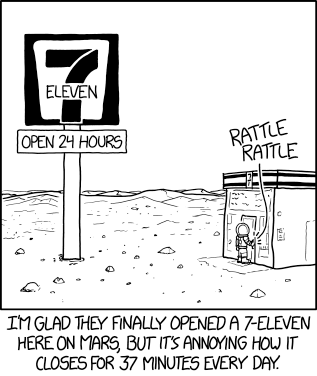 DavidSh wrote: The 7-11s I have actually checked have all opened at 7am, although that isn't very many of them. How many of them? Was it 11? Apeiron wrote: "Really, the only honest 24-hour stores are the ones in places like Arizona and Hawaii (sic), and many of them are still wrong in certain years." Each one is a one. Several ones are ones. Compare "there are millions of them". Several millions. "Mechanic: Okay, your car will be fixed up by Friday morning. Customer: But didn't you say it'll be done in 24 hours? Mechanic: Yeah, 8 hours on Tuesday, 8 hours on Wednesday and 8 hours Thursday..."
I've long felt that "hour" should be defined, on whatever planet you're living on full-time, as 1/24th of a day, and schedules made accordingly. Mind you, such a position does have its drawbacks. One of Asimov's early stories took place on a planetary moon where the enthusiastic but somewhat dimwitted locals were told about the annual celebration of Christmas and insisted on observing it, with the humans discovering too late that they now expected the full shebang every nine Earth days or whatever the period of that moon around its primary happened to be. Soupspoon wrote: But what I hate is "24/7/365",as a 'motto' or directive. The latter number should be more like 52, or thereabouts. Is there anywhere in the world with a greater density of 7-11 stores than Bangkok? Where the name might almost mean "between 7 and 11 outlets per city block". ...I guess they may be working on this version of a day. Somewhat more on-topic... a few months ago I've actually seen a bunch of people told to walk out of a 24-hour store on 23:40 or so (just after we were lucky enough to finish packing our own groceries) - apparently (or so we were told) because the store's cash registers couldn't handle working across a day change, so they had a technical break from 23:45 to midnight. I think I told the guys to go to the other 24-hour store next door, which I knew did work across midnight (they did have a technical break, IIRC, but at some more convenient time, like 4am). There's a shop near me, which has a giant 24H on it's side. And on the door, it has a small printed page saying they have a break from 02:00 to 04:00. (it's been there for at least two months). Even though I'm unlikely to need it at that time, and there's a truly 24h gas station near enough, it still infuriates me every time I think about it. Closed on Feb 29, then? keithl wrote: They need 37 minutes per day to replace all the freeze dried and vacuum dessicated fruits and vegetables. Just potatoes. Lots and lots of potatoes. Why Arizona and Hawaii? I am missing something about the alt text. Why did OP add “(sic)” though? The spelling is correct. Flumble wrote: While I have never encountered a 7-eleven (even though they do exist "nearby" in Denmark, Norway, Sweden), I've always thought the 7 was for 7 days per week and the 11 for 11 hours a day. When I moved to the US in 1998, it took a while before I understood what 7-Eleven meant, and when I finally did, I was struck by how anachronistic that was, since all the grocery stores (supermarkets) around here (NJ, not far from NYC) are open at least 16 hours a day. In fact, many were open non-stop, although that appears to have been a passing fad, most went back to a 6 AM to midnight or similar schedule eventually. For an even more anachronistic name, look up Motel 6. That 6 used to stand for $6 a night! Last edited by GlassHouses on Tue Apr 18, 2017 7:54 am UTC, edited 1 time in total. DST stands for Daylight Standard Time? Those two states don't change between Daylight Savings and Standard Time like everybody else. Obviously you don't play Kingdom of Loathing. whomever1 wrote: DST stands for Daylight Standard Time? Those two states don't change between Daylight Savings and Standard Time like everybody else. Obviously you don't play Kingdom of Loathing. DST stands for Daylight Saving Time. It's vexatious that standard, saving and summer all start with an 's'. So a Usanian could easily assume that "BST" was the "Standard Time" variant of London time, whereas in fact it's the "Daylight Saving" (S=Summer). And that's before we get into "GMT", which is often taken to mean "London time", leading to such abominations as "GMT Daylight Time". The whole thing is a mess, really. The standards have worked around the issue by ascribing timezones to cities (e.g. "Europe/London"), which is the only sane way of doing it; nevertheless most humans like the three- (or four-) letter abbreviations. Furthermore, a lot of people probably think that this is the standard way of doing it, since the TLAs "feel" like other standardised abbreviations (ISO country codes, currency codes etc). ETA: Another issue with the city-based timezone identifier is that it can seem metrocentric. Why should a company proudly based in, say, Liverpool organise its meetings in the "Europe/London" timezone? And where are "Europe/Edinburgh" and "Europe/Cardiff" for that matter?